Within the context of Habitat III process towards the New Urban Agenda, Montreal hostthe Thematic Meeting on Metropolitan Areas on October 6th and 7th, 2015.The Communautémétropolitaine de Montréal(CMM), with the support of the Government of Canada, the Government of Quebec and the City of Montreal. 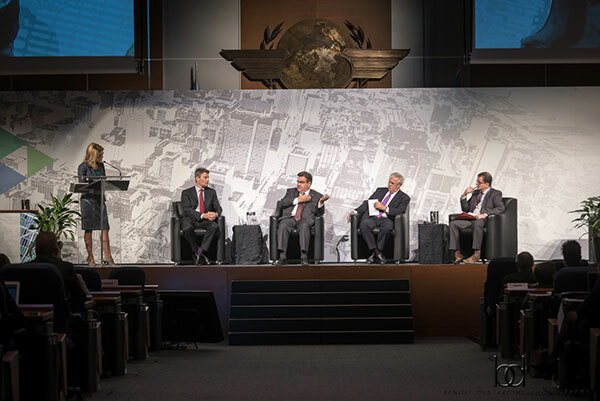 More than 500 stakeholders representing national governments, local and regional authorities, metropolitan and civil society organizations, the media and others gathered at the headquarters of the International Civil Aviation Organization (ICAO) to begin deliberations and to adopt the Montreal Declaration, aimed to acknowledge the relevance of metropolitan areas in addressing future economic, social and environmental challenges in the global urban agenda. Dr. Fang Liu, Secretary General of ICAO, began the opening session by identifying that for the first time in history most human beings reside in urban areas, and that transportation in all its forms is also important to sustainable development, in addition to highlighting ICAO’s efforts to support an international conference and agreement on aviation. The Honorable Denis Coderre, Mayor of Montreal and president of the CMM,emphasized the role of metropolitan areas in meeting current and future development challenges, which were discussed in more detail during the two day event. He also elaborated on the progress achieved in the city of Montreal, and how metropolitan areas must have a vision where social development goes hand in hand with economic development. Dr. Joan Clos, Secretary General of Habitat III and Executive Director of UN-Habitat, explained how the newly adopted Sustainable Development Goals for 2030 (SDGs) recognized urbanization for the first time as an important tool and driver of development and addressing poverty. He expressed his hopefulness that Habitat III will be able to generate a paradigm shift in how we address and manage urbanization, which critical considering that most urban development and metropolitan growth will be occurring in developing countries in the coming decades.While urbanization and the growth of metropolitan areas took a long time in developed countries, today the pace is much quicker and large human settlements are built and expanded in just a few years.Therefore,good planning andurban development must be done with great care, especially when considering that the roles and capacities of central and local governments vary from country to country. “The discussions in Montreal are important to understand how to manage transition and processes” emphasized Dr. Clos, and as the post-manufacturing economy is translated into rapid metropolization he added “There are no common or identical metropolitan systems in the world,which is usually because of the unique political dynamics and playerswho affect local conditions”. Mr. Gregory Robertson, Mayor of Vancouver, noted that cities have to take action and he emphasized the need of making sure that urban tax payers see their contributions returned asinvestments that make our cities more resilient. He also commended Habitat III for “having an open mind and including the voice of cities”, and expressed his interest in improving this collaboration to find solutions to challenges such as affordable and social housing. The opening session also included a panel discussion where the speakers elaborated on governance, housing and opportunities, and shared a common vision where cities are viewed as generators of culture, opportunities and prosperity. Mr. Alfred Bosch, Metropolitan Area of Barcelona, noted the opportunity for metro areas to bring political players together;”metropolitan areas are better places to achieve political collaboration because these areas are built and managed on this type of cooperation that involves many stakeholders”. When asked about his recommendations, Dr. Clos gave examples from various countries that have decentralized the management of their metropolitan areas, and that in order to be effective in managing massive urbanization “central governments must adopt legislation that is based on the reality, instead of adjusting our reality to fit with legislations…addressing the reality of citizens and metro areas is a priority and not a political battle for power”. This would eventually require examining the social contract to be more accommodating to the people and the challenges associated with urbanization. A press conference followed the opening session with Mayor Coderre and Dr. Clos,which added more focus to the issues discussed in the conference. They agreed that it is a prerequisite to have a “reality check” about metropolitan areas and urbanization in order to generate the right solutions, which is why metropolitan areaswere identified as an important element within the Habitat III Conference. Some of the media questions focused on the issue of national governments and the autonomy of local authorities, to which the Habitat III Secretary General responded by elaborating that, as a United Nations Conference involving all Member States,”Habitat III aims to improve local authority participation through working with all partners to bring the voice of local authorities to the table and process, while remembering the important role of other political players”. Mayor Coderre and Dr. Clos ended the press conference with a common view of placing a real value on local authority participation, with these authorities already being engaged in the Habitat III process, and hoping that more ways will be found to link them to addressing challenges and the development process as a whole. In addition to various high level meetings and side events, the first day included two in-depthdialogue sessions featuring panels of experts, officials and representatives of local and metropolitan governments. The first dialogue session examined the social, economic and environmental challenges that face cities and the possible ways of addressing these issues to ensure the metropolitan areas we want are secure, resilient and sustainable. The second dialogue session was devoted to strengthening metropolitan coordination, with panel members sharing their concerns, experiences and good practices that have yielded good results on the ground. The issues of financing, governance, cooperation and participation were emphasized as salient issues during both sessions. The activities and the discussions that took place in the first day were concise and characterized with much openness and transparency, and focused on reflecting it all in the Montreal Declaration on Metropolitan Areas. The second day delved into the contextualization and presentation of the Montreal Declaration, with the draft version being available to participants online in advance of the conference. Discussion sessions on the Declaration occurred within three groups: representatives of Member States, representatives of Local, Metropolitan and Regional Governments, and representatives of Civil Society. As with the first day discussions, the Declaration talks were marked with a great level of openness and participation, while having an overall strategic vision for all inputs. The aim was to enable all participants to voice their concerns and recommendations, and the integration of the recommendations in the New Urban Agenda for the next 20 years. The Secretariat closely followed these three simultaneous discussion sessions to ensure that all perspectives and contributions were accounted for and reflected in the Declaration. The closing session brought all the stakeholders together again for the adoption of the Montreal Declaration, were it was noted that more work and cooperation will be occurring in the coming year leading up to the Habitat III Conference in October 2016. The Montreal Declaration on Metropolitan Areas will be available on this website by October 14th, 2015.